I made this cake for Christmas Eve dinner. If I may say so, I think this is the prettiest cake I have made to date. My parents and the Partner all said it tasted wonderful. I totally regret not having taken a picture of the entire cake! The cake was pretty easy to make too. I had a few naked oranges with me after using their zest for the earlier orange and almond cake (the farewell cake). This orange marmalade cake uses orange juice instead of zest. The original recipe called for self-raising flour and baking powder, but I used stiff egg whites instead. I love beating egg whites to stiff peaks! 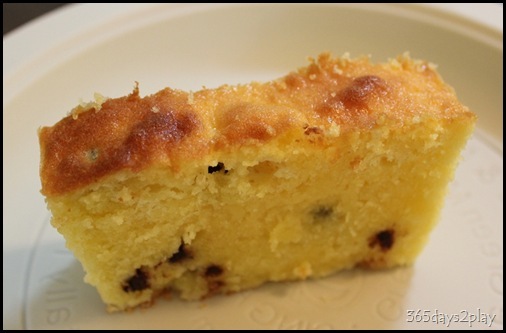 Wonder if anyone wants to buy my orange marmalade and chocolate chip cake for Chinese New Year? Hahaha thanks! I hope to be able to replicate it again soon!